In a Nutshell: Besides winning the lottery, the quickest route to improving your financial station is securing a better-paying job. While higher income is important, you also want a job that truly complements your strengths and interests, which generally leads to longevity in the workplace. Designed to be an informative, comprehensive job-seeking experience, The Muse is an online career platform that provides a catalog of job listings, behind-the-scenes business profiles highlighting company culture, as well as career advice and coaching. No matter where you are in the job search process, The Muse has resources to help you take control of your career path. I remember the first job-search site I ever logged onto. I was fresh out of college, in debt, and in desperate need of employment. While perusing the site, I noticed that every job listing said essentially the same thing: “seeking a self-starter who works well under pressure, has good time management skills, and is a team player,” or something to that effect. The job description for the Junior Copywriter position was almost exactly the same as the Office Manager job description for Arby’s. While I felt perplexed and disengaged, I was also sick of my ramen noodle diet. Plus, I needed to pay the rent, so I begrudgingly submitted my polished-up résumé to as many jobs as I could find. Soon after, I began receiving impersonal emails from staffing agencies that now had my contact information, attempting to recruit me for positions that I had, more or less, no genuine interest in. Eventually, I did find work I enjoyed, but the search process was incredibly frustrating. And I’m not the only one who thought the job-search process needed improvement. The folks behind New York City-based online career platform, The Muse, clearly agreed. Kathryn Minshew, Alexandra Cavoulacos, and Melissa McCreery met while they were working as management consultants at McKinsey & Company in New York when. After working on a few projects together, the trio discovered that their strengths, interests, and working styles were a great match. Still in the process of figuring out their long-term career plans, the three came to the same realization I did years ago: available job-search sites were mostly antiquated and painful to sift through. The three moved on from McKinsey, and, years later, decided to create a more engaging online experience for job seekers — one where users weren’t just scrolling an overwhelming list of generic job descriptions and salaries. They wanted to help people find opportunities that they didn’t know existed, and also give them a glimpse into the working environments for the companies being featured. So the trio launched The Muse in 2011. Originally catering exclusively to twentysomething women, the site’s user demographic has since evolved, now appealing to everyone from millennials to more experienced professionals. Through a combination of resources, coaching services, and user-friendly search features, the online resource now helps 50 million job seekers per year expand their career options while providing helpful career tips along the way. The Muse stands out in the online job-searching space by not only providing more than 80,000 job listings across all industries, but doing so on a user-friendly platform run by a team who genuinely cares about the success of its users. The site allows you to sort by industry, location, and skill level, and you can also choose from job listings that will allow you to work from home. 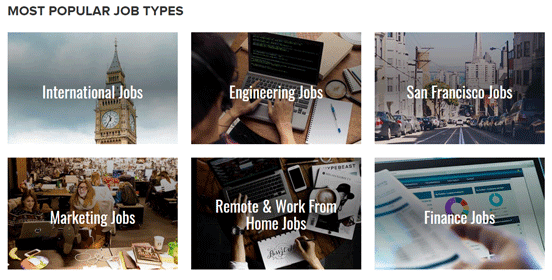 Engineering and work-from-home jobs are among the more popular listings on The Muse. When you choose a company listed within any category, you’re directed to a page that allows you to learn more about the organization. There, you can research the company’s history, view images from inside the offices, and access all of the current openings. Some company pages even have videos of individual employees talking about their role in the organization, while showcasing the personality and culture of the company. These company pages add much-needed transparency to the job-search process. Users of The Muse have the unique opportunity to apply for jobs that are great culture fits, while avoiding spending valuable time applying to those that don’t mesh with their priorities. Even though The Muse gives site visitors numerous self-service research options, sometimes a little bit of professional help can go a long way. For personalized guidance, users can access coaching and mentoring services for hire. Coaches are reviewed on the platform so you can learn about them before signing up for their services, and experts in a variety of different career fields are present on the site. They offer services for any level of experience, including those who are just out of school as well as those considering a career change later in life. Your coaches will work with you to identify your needs, and guide you through everything from beginning a job search to preparing for interviews. They are also available to review your résumé or provide direction when you’re ready to do the scary stuff, like asking your boss for a raise. Each mentor and coach has been vetted by staff members at The Muse, and representatives are on hand to answer questions and address any concerns you have before booking your first session. Family and friends are even provided the option to gift coaching and mentoring sessions to those who might need career guidance. Gift packages include options for mentor sessions, coaching sessions, and master coaching sessions in areas that range from résumé and LinkedIn reviews to discussing job-searching strategies. If you’re seeking career advice, it can be tempting to turn to someone like your mom, or perhaps a best friend. When it comes to your personal career path, however, some thorough notes from experts in the field are almost always going to be more effective. The site’s Career Advice page gives users access to posts filled with advice from The Muse editors and contributors, whose experience gives them knowledge of a variety of professional industries. The site also partners with popular brands, like Amazon, Wells Fargo, and Squarespace, to deliver tips on popular topics such as how to manage time, how to interview, and even how to build a brand. Additionally, this section provides specific answers to many of your burning questions, like what should be on your post-interview checklist and which habits to ditch if you want to have a successful day. You’ll even find location- and career-specific posts, like 10 Great Boston Companies that are Hiring Now, or 20 Companies as Great as Apple (and Hiring Now!). This way, you can forgo your best friend’s well-intentioned (but often uninformed) advice, and learn from people who have real insight into precisely what you’re seeking. The Muse also offers advice for entrepreneurs, so if you’re a self-starter who’s interested in following in the footsteps of company founders, like Kathryn, Alex, and Melissa, the site can guide you in this area, as well. Let’s face it, being unemployed is a drag. Finances become tight, and the process of looking for something new can be daunting, especially when compounded with the stress that comes from being strapped for cash. However, with the right resources, the search itself can be engaging and exciting — and could result in possibly landing your dream job. Whether it’s turning to a career coach, browsing the advice section, or exploring companies, you’ll discover that The Muse provides many exciting opportunities to learn how to grow within your field. Finding a great job that you love can have an enormously positive impact on your finances. It can also help you keep your pantry stocked with anything but ramen noodles. Elizabeth is a creative media professional with over ten years of journalism, branding, and copywriting experience in fields ranging from finance, to commercial print, to travel and entertainment. She’s written features for popular media outlets under publishing groups like Northern & Shell and American Media. Elizabeth holds a degree in Philosophy from UCSD where she also studied Creative Writing. When she's not writing, she can be found traveling around Southeast Asia surfing, working with nonprofits, and collecting vintage textiles.